Join Plymouth Tube Co. at the SHOT Show 2019! There are two opportunities at the Show to see what Plymouth Tube Co. can do for you. Visit us at Booth #S1622 during the Supplier Showcase on Monday, January 21 and Tuesday, January 22, 2019. Located on the 5th floor of the Venetian Hotel, the Supplier Showcase is a dedicated event for suppliers to present their products to shooting, hunting and outdoor manufacturers. If you use or produce tools, machinery, plastics, metal extrusions, fabrics, OE materials, fabrication, logistics, software, or other products and services for the shooting sports or outdoor sporting industries, then SHOT Week’s Supplier Showcase is your opportunity to connect with each other at the upcoming SHOT Show. 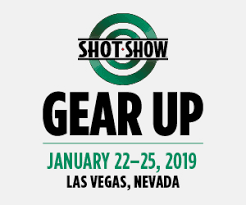 The 2019 SHOT Show runs Tuesday, January 22, through Friday, January 25, at the Sands Expo and Convention Center, Las Vegas, Nevada. GEAR UP with more than 64,000 professionals from the shooting sports, hunting and law enforcement industries coming together. Gain access to the products, the suppliers, the connections and the know-how to strengthen your business. You will find Plymouth Tube Co. at Booth #2650. Plymouth Tube strives to achieve tolerances and specifications exceeding firearm industry standards. As an extended arm of your Engineering department, Plymouth learns as much as possible about your specific firearms application and offers solutions based on your needs. Our proprietary processes provide tubing and profiles which are “machine ready,” saving valuable production and machining time, minimizing cutting tools, reducing scrap and eliminating waste. Profiles are available for both symmetrical and non-symmetrical applications, which means Plymouth´s precision geometric profile combinations and shapes are nearly unlimited. Aim in the right direction- Specify Plymouth.